Ciao Amici e Buon Anno! Speaking of, I had a fantastic club ride this past Saturday, what was supposed to be a 80km (50mi) club ride turned out to be a 92km (57mi) ride, can’t say my muscles enjoyed it though not having done such a long ride since the 94.7 Cycle Challenge in November last year. It turned out to be just over a 4h ride with about 20 – 30 mins of stopping time, pretty good pace if you ask me. On that note If you feel you’re lacking motivation to train or just don’t want to train on your own, join a club – not only will you then have to train due to the financial commitment but the benefits of training with a group will soon become apparent 🙂 Not saying you can’t train on your own, you just better be committed to it, I’ve done most of it on my ace since sep’10. The hardest part of getting back into my training has been the running, haven’t built my way up last year to 5km and now getting to 2km before being dead. It’ll take another week or two and I’ll be back on track. There is a saying I heard a while ago which I feel is very fitting in my case – runner’s can cycle but cyclists can’t run. There is a great little website I use to track my fitness (www.fittrack.co.za), it doesn’t give you a full breakdown but it is nice to see where your fitness lies on a line graph and how you have progressed over the weeks. For a more detailed way to track your workouts try Runtastic on your phone (www.runtastic.com), I’ve only been using it for a week now but so far so good, I will see how the reports fair over this month. Seems like my phone might just become my new training partner (HRM, GPS, MP3 Player) what more do you need 😉 That gives me an idea I might just create a tab on my blog to track my weekly and monthly training, watch this space. If you have any other apps or website that work, let me know I would love to see them. 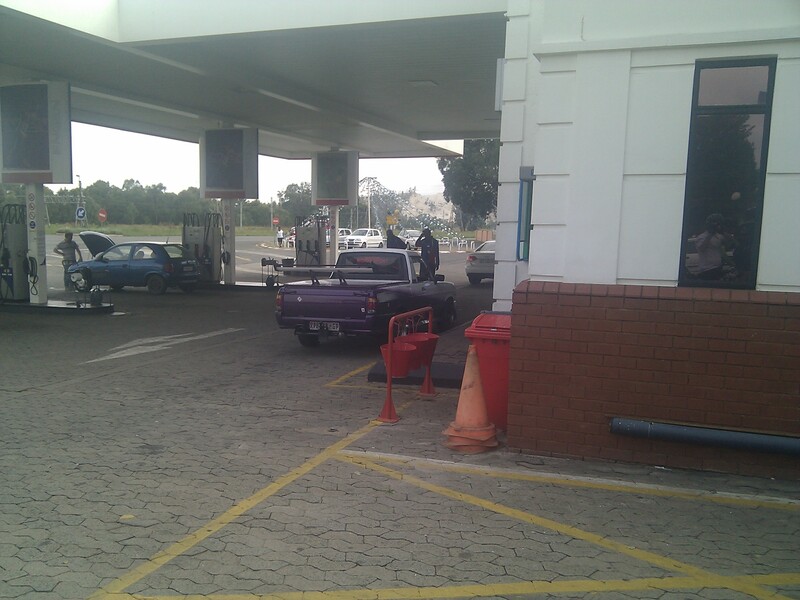 I just had to share this photo, took it at the garage as we got into Randfontein on Saturday morning on our ride, just amazes me what some people do their cars.. Here is to wishing you many happy hours and mileage of training in 2012. You do any training at all?